Every hungry family is hungry in its own way. It is a terrifying, Tolstoyan truth: you are all alone in the pantry, with nothing for company but unlabeled grains and a junkyard of abandoned dinner ideas. No one knows how to feed your family. Even your own family doesn’t know. I mean, they’re starving. Who can think when you’re that hungry? No book can tell you. 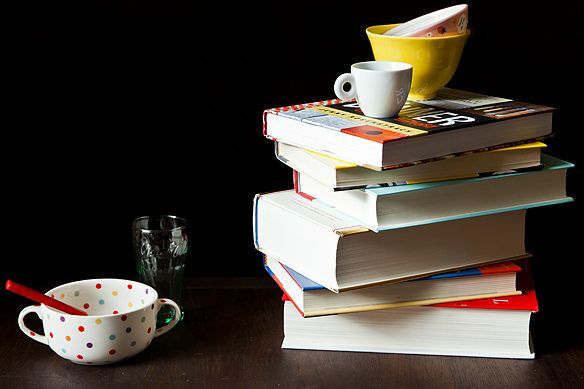 There are now splendid cookbooks in almost every imaginable culinary category, not excluding salumi making, but any parent looking for good advice about what and how to feed their family will run into a chicken-fingered wall. This is a genre in which the most prominent cookbook, Laurie David’s The Family Dinner, is written by someone who employs a family cook. Half of all family cookbooks take the fun out of cooking, in a 1950s, home economics sort of way: here we will manufacture this thing we call dinner, which is composed of foodstuffs. The other half, the chef-authored ones, are inadvertent parodies of how not to cook for a family, and for an obvious reason: at dinner time, no chef is cooking for his family. No one asks an architect how to build a blanket fort. Do I sound tense? I’ve been thinking about this—the promise and peril of family dinner—lately because we have just added a new human to the household. (Meet Samuel, also known as Mila: he is a gorgeous, gurgly nonagenarian fatso.) For those of you keeping score at home, that’s two big humans, two small humans. They’re catching up. Not coincidentally, we also just added a new recipe binder labeled sanity. It does not include the family recipe for tortellini. Am I aware that last time I was here I told you to make a different sort of individually-filled dumplings? I am. Am I going to admit that this is an ironic juxtaposition of columns? I am not. Do I still insist that those dumplings are totally worth it and way easier than you’d expect and have the potential to save actual lives? Yes. 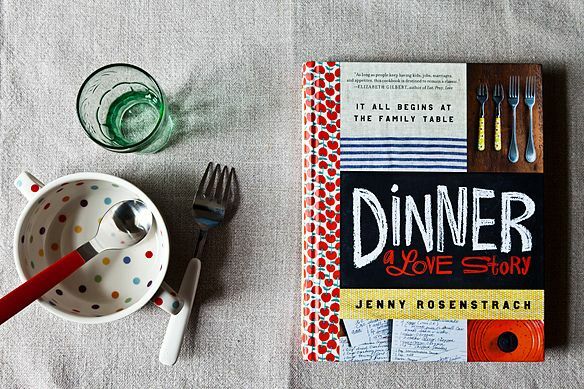 Mila’s arrival coincides with the publication of Dinner: A Love Story, the cookbook version of Jenny Rosenstrach’s blog. Her book and blog are something very rare in the genre of family dinner: they inspire neither homicidal nor suicidal impulses. Dinner: A Love Story works for a few reasons: a realistic but not humiliating appraisal of your time-limited capabilities, a balance between aspiration and actually getting to eat, a voice that manages to confide without you wanting to tell it to stop confiding already. But what I like most about Dinner is that it is honest about what it will not do: it will not solve your problems in “three easy steps!! !” Indeed, the story that Dinner: A Love Story tells is the creation of Dinner: A Love Story. Rosenstrach gives a lot of tips, and a lot of recipes, but the implicit point of the book is that, in the end, you have to write your own Dinner. No one can do it for you. This is why the cookbooks to which people turn most desperately are the worst of all. 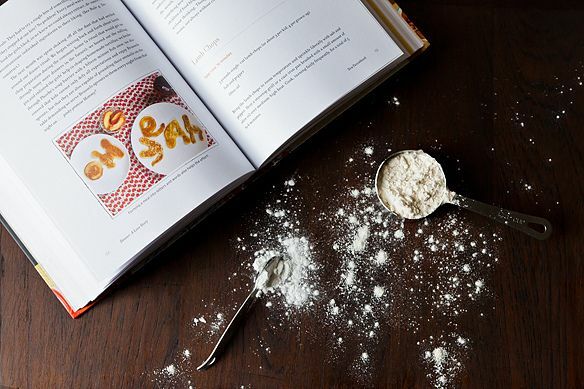 Most cookbooks make sense because they speak to particular tastes: a taste for Moroccan food, say, or donuts. But family cookbooks address the audience of people with families—which is nonsensically broad. There isn’t family dinner. There are only family dinners. Right now Mila’s mostly mouth and underdeveloped esophagus. Even by our radically lowered standards for dinner companions, under which FORHESAJOLLYGOODFELLOW counts as conversation, he’s no dinner companion. But in the years ahead he promises to make a mess of the few things I thought I knew about feeding children. And to make the title of that new binder look deeply ironic. But there’s only one of him. If we can crowd-source this sanity thing, we might yet have a chance. For the sanity file, I recommend Rosenstrach’s kale with avocado and pickled red onions. Why? 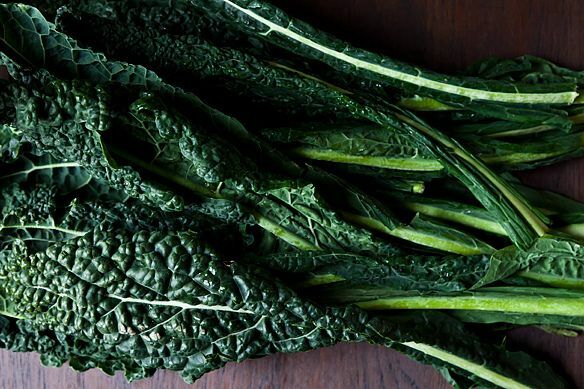 And why kale, of all things? Here’s why: 1) because pickled red onions, like smoked paprika, make everything better; 2) because avocado is what you give children instead of giving in to more butter please; 3) because of my self-deluded, Jenny Rosenstrach-bolstered faith that, even in our new state, kale is not a four-letter word. I think most babies will eat most food if they are offered. If refused try again in a few weeks or months. Some balk at particular textures or tastes, but even that moves on with time. Of course there were some mainstay meals for when my mind went blank - roasted root vegetables with sausage, all done with olive oil in the oven and a dash of balsamic at the end. No thinking. My kids are young, live in the moment, and love it when I give them something to talk about with their food. Meanwhile, I love it when someone gives me an idea for a new flavor combination that won't take all day to make. Thanks! One of my favorite cookbooks for family dining is "Hungry Monkey", by Matthew Amster-Burton... In particular, he's got a bunch of recipes that are fully-flavored, but very soft, which has been great for my late-teething daughter. (Chicken thighs stewed with smoked paprika, for instance.) It's a mix of memoir and recipes, but it also gives you something to laugh about after you've finished scrubbing avocado out of the high chair. I rarely cook straight from the cookbook, but I'll often leaf through to give myself some inspiration when I'm in the culinary dumps, and thinking about making spaghetti and meatballs for the second night in a row. Crockpot. I usually do the prep work after my toddler goes to bed, and then throw everything in and turn it on right before I take her to daycare. Then when I get home, I'll throw together some sides. Microwave, microwave, microwave. I talk about this over on my blog (http://articificialintelligentsia.blogspot.com/), along with a bunch of recipes under 30 minutes, but a lot of things go a lot faster if you start them in the microwave and finish them in the oven or on the stove. For instance, I'll microwave squash for 6-8 minutes, and then roast it for 15, or nuke mushrooms to get some water out and kick start the browning process. When you have a hungry toddler on hand, every minute saved is a minute you don't have an hungry child clinging to your leg like a ball and chain. Don't be afraid to throw some pre-made stuff into the mix. For instance, we might have a scratch made preserved lemon risotto, served with crab cakes from Trader Joes. Sometimes that's what sanity takes, and if you've got healthy pre-mades on hand, then you're less likely to throw in the towel and head for the pizza parlor. Totally with you on Hungry Monkey -- that book's a delight. This recipe was awesome. Thanks! Love this column. DELIGHTFUL! Just go ahead and order this book. You won't regret it. real life. Refreshing and joyful. My copy of Dinner came in the mail yesterday. I've spent the whole day fondling it; stealing passages and pictures as I make my way through the from the laundry room to dresser drawers. It's supposed to be my "school's out" present (teacher), and I'm having difficulty waiting! So happy to see a review here. This article puzzles me. My son (who is now 23 and manages a restaurant in San Francisco) would eat many things, but at the same time he gagged on avocado, zucchini (except grilled), and raw tomatoes. We tried many supposedly child-friendly cookbooks over the years but the hands-down favorite was Kids Cooking from Klutz Press. He was encouraged to cook things that he might not have eaten if we put it in front of him first. And the recipes are delicious for adults, too. He really liked that the book came with his own set of color coded measuring spoons, too. It helped us diversify his palate. Weirdly, the kid always liked lox, sushi, and anything with lots of garlic. I'm (almost) 32 and that Kids Cooking from Klutz Press was the cookbook that gave me my start too! I still use the guacamole recipe from that book. The Six O'Clock Scramble: Quick, Healthy, and Delicious Dinner Recipes for Busy Families (Aviva Goldfarb) & sequels do exactly what you are talking about. I do not have children so it's just my husband and me, I seriously need inspiration most days. I love your writing and I thank you for your article on shumai & dim sum. We love din sum but even though I come from a serious cooking family, the thought of making my own dim sum has never occurred to me. I've made egg rolls but I never once thought about making dim sum. Trust me, I will now. I so love FOOD 52 and I love your articles. You make me laugh and that's a good thing! I wanted to share with you the post I just put on my Facebook page. 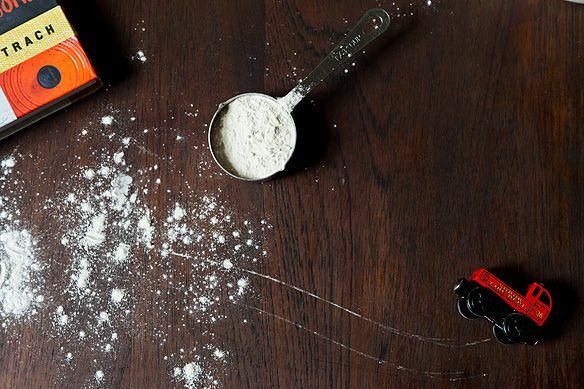 I look forward to spending more time with you via FOOD52. YUM! I love FOOD 52. When I first found this web site, which makes everything in the kitchen easy, entertains me immensely, and actually answers your questions among other things, all I did was find new ways to cook all the veggies I love to pieces but generally just steam, because it's easy and in my opinion the flavor of pure vegimals is heavenly.Sure I've been baking my cauliflower for a long time now but that's just to get David to eat something cruciferous. Check out the site, set up an account and that way you can save the recipes that catch you eye, then envelope your senses in words that make your mouth water. They've got great detailed images on how to do things other sites and recipes assume we all know how to do. Their articles are actually entertaining. I honestly can't say enough about this site. And, the next time I leave the house, I'm getting wonton wrappers and a bamboo steamer and I'm making dumplings (check the link to that article & recipe at the bottom of Nicholas's article Dinner vs. Child. This recipe looks lovely. Unfortunately the link to save it to the Food 52 recipe box goes instead to the Dinner A Love Story website. Any way to correct? Sorry about that -- the link should be fixed now! Mila's a 90+-year-old fat person? Kale and pickled onions sounds great, and I would have happily served it to (forced it on) my children, who will eat veggies of all kinds -- were they still living at home instead of cooking for themselves in their own digs. But I love kale, simply and swiftly done, sauteed in olive oil with shallots and lemon juice, or that slapped between two tortillas with some feta or goat cheese and basil. And I particularly love kale and bean and tomato soup made from a thawed quart of Rebecca Katz's Magic MIneral Brother. Lacinado, which is the variety I'm presuming is pictured, is particularly good for the potential non-kale enthusiasts in your group. i hate to be the skunk at the garden party, but though "dinner" may be an interesting, intriguing, or even a good book, the decision to feature jenny's recipe for "kale with avocado and pickled red onions" in your column strikes me as unusal, to the point of being bizarre ... whose family anyway? certainly not one with any member under about 40, and who has not lived long enough to develop a taste for 3 ingredients which are rare extremely on the average (american) family dinner table ... maybe they shouldn't be, but they are (not sure about TOTAL vegetarians or vegans) ... maybe the book should be called "eat your veggies, they're good for you, even though you may never have heard of them" ... (avocado instead of butter? that's a joke, right?) ... i'm sure kale, etc. is delicious to the sophisticated palate, but as good choice for a "family dinner"??? gonna be a lot of hungry people in that family after dinner. That's the whole point, really -- we should be less hidebound about these things. And I'll stand by that point way past bedtime. Where do "sophisticated palates" come from, if not early introduction? I'm not sure about the pickled onions, but my 15-mo-old loves both avocado and kale, mostly because they're not "weird" to her. We've been feeding her kale since she had to have it pureed, so she's used to the taste. Now that she's a little older, she's more novelty averse, so introducing new foods is harder, but kale is still on the menu. I have two boys (ages 5 & 3) and one more on the way, and I totally agree with your assessment of "family" cookbooks. When I'm really stressed out trying to come up with dinner I think of three categories: breakfast, pasta, and tacos. I almost always have eggs, pasta, and tortillas around, so then I just use up whatever protein & veggies I have to make it a meal. "Dinner: A Love Story" sounds really intriguing...I'll have to check it out! I have the family Dinner.....and I'm the 'employed cook' and mother and a lot more. I'm completely smitten with your words and your writing and even though I cant find kale in Nigeria,....I'm desperate to plant some. Thanks to you. Big hugs to Mila.....with a bow!